Stephanie Mills has been a writer, editor, and speaker on matters ecological, bioregional, social, and political for the past fifty years. Famous for her commencement address at Mills College in 1969, “The Future is a Cruel Hoax,” she went on to serve as the assistant editor of Co-Evolution Quarterly and editor-in-chief of Not Man Apart, Cry California, and Earth Times. She has produced seven books, including Epicurean Simplicity (2002), Tough Little Beauties (2007), and On Gandhi’s Path: Bob Swann’s Work for Peace and Community Economics (2010). Mills’s 1989 Sierra Club book, Whatever Happened to Ecology?, is a personal narrative of her journey into the bioregional movement. 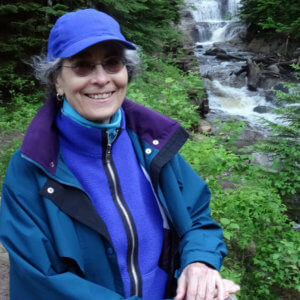 A longtime bioregionalist and veteran of the Whole Earth publications, Stephanie Mills has written scores of essays and articles appearing in publications from Orion Magazine to The Britannica Book of the Year, as well as in numerous anthologies. Active in her community, Mills helped launch a local currency in northwest Lower Michigan, where she has lived since 1984. Featured in the 2009 PBS documentary EarthDays, in 2015 she received an Arthur Morgan Award from Community Solutions. Stephanie Mills holds an honorary doctorate from her alma mater and is a Fellow of the Post Carbon Institute.